When we launched Del Carlo Winery in 2005, our goal was to make small amounts of delicious, food-friendly wines that showcased our quality estate-grown fruit. We are happy to report that we’ve about achieved our goal and we love sharing our wines and showing off our beautiful Home Ranch property. Dry Creek Valley reminded our ancestors of the Old Country and drew them to settle here. We are forever grateful for their foresight in recognizing that the valley’s soil and climate were ideal for growing world-class wine grapes. Del Carlo was selected as the name for our winery to honor Ray’s mother (Lucille Del Carlo) and her family, who had a grape ranch and bonded winery in West Dry Creek, not too far from our current site. Today our well-established vineyards produce highly respected and sought-after grapes, and we have the luxury of selecting our very best vineyard blocks to produce our estate-grown Del Carlo wines. 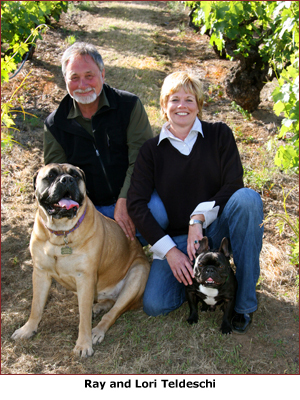 For decades, Ray Teldeschi Vineyards has provided the grapes for some of your favorite Zinfandels. Now, our family invites you to enjoy our own wines—Cabernet Sauvignon and our Zinfandel made from century-old vines—produced from our estate vineyards. Because we produce only small amount of our estate-grown Zinfandel and Cabernet, we can take extra care with each barrel. Here is one example our unusual approach to winemaking. Federal law requires that each wine barrel have a unique designation. Most wineries stamp barrels A23, A24, A25, etc. We do things a little differently. All of our barrels are named after our animal friends, past and present—names like Taser, Tallulah, Vito and more. you’re sure to be greeted by Zeke, Vito and Tickle. Our love of the land is reflected in every bottle of Del Carlo wine. If you haven’t yet tasted our Zin or Cab, we hope you’ll do so soon.